Mary over at Mary’s Meanderings had been saving the frame of an old bench that had seen better days. Then she pulled out some leftover wood flooring slats and went to work. Just look at the gorgeous result! Isn’t this just pretty as a picture? Kim from Savvy Southern Style took an old wooden changing table, sanded, primed, painted and glazed to get to this gorgeous result. I was particularly smitten with this idea as my youngest son loves to play baseball. 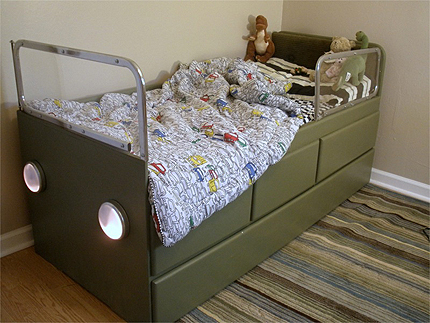 This is a great idea that will cost next to nothing and that special little boy will love. Looking for a unique way to dress up your guest room? Kierste from Brown Paper Packages shows us how to take a broken chair and turn it into a darling night stand!